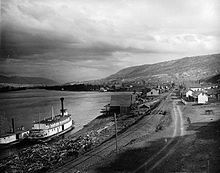 Cathair i ndeisceart na Colóime Briotanaí, Ceanada is ea Kamloops. Tá an baile i ngleann na hAbhann Thompson, 370 ciliméadar thoir-thuaidh ó Vancouver, agus é suite ar Mhórbhealach Cheanada. Fuair daonáireamh na bliana 2006 80,376 duine ina gcónaí in Kamloops. Tá Kamloops san áit a dtagann dhá chraobh na hAbhann Thompson le chéile, mar atá an Abhainn Thompson Thuaidh agus an Abhainn Thompson Theas. Tá Loch Kamloops ar an taobh thiar den chathair. Bíonn an aeráid séimh i gceantar Kamloops. Faigheann an chathair 2,500 uair de sholas gréine sa bhliain agus gan ach beagán báistí (330 ml sa mhí). Ní bhíonn mórán laethanta seaca ann. Fásann cachtais agus an scuab sáiste ann. Bunaíodh Kamloops agus na hEorpaigh ag taiscéaladh iarthar Cheanada san 19ú aois. Éireannach dárbh ainm John O’Connor an chéad duine le dul chun cónaí san áit. Tháinig daoine eile, Béarlóirí agus a líonta tí sa chuid ba mhó, ina dhiaidh, agus de réir a chéile d’fhás pobal ann. Díorthaíodh an t-ainm Kamloops ó "Tk'əmlúps", focal sa teanga Indiach Shuswup a chiallaíonn 'teacht le chéile na n-uiscí'. Tá caomhnú Shuswup ar chríoch thuaidh na cathrach, agus labhraítear Shuswup sa cheantar i gcónaí. Kamloops cois Thompson, 1887. Tá galbhád agus Iarnród an Canadian Central Pacific le feiceáil i réamhionad an ghrianghraif. ↑ Tk'emlúps Indian Band, Tk'emlúps History, 2011. Arna rochtain ar 13-07-2012. Tugadh an leathanach seo cothrom le dáta an 23 Aibreán 2016 ag 03:07.